Already without flowering contents the vases from our Bunzlau ceramic range are a feast for the eyes! Whether you are looking for tasteful table vases or opulent floor vases - we have many different models with the traditional sponge décor ready for you. Our vases are all unique, which were made and painted in loving craftsmanship. They are made of particularly high-quality clay, which has been extracted from the Lower Silesian Bunzlau since the 17th century. Bunzlauer ceramics are fired at almost 1300 degrees Celsius. These enormous temperatures make the material exceptionally robust and heat-resistant. The century-old pottery from Bunzlau is world-famous. Bunzlau Polish Pottery is internationally recognized and is considered a stable and valuable investment. In our online shop you will find vases in classic and modern forms. Playful amphorae, nostalgic jugs with handles, bulging, angular, waisted models or even in the form of an old hot water bottle, which pre-heated the beds in grandmother's time. 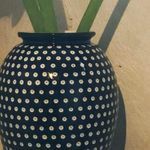 Even though our vases differ externally, they all have their incomparable and indestructible core from Bunzlau ceramics. Thanks to the excellent properties of the Bunzlau ceramics, our floor vases are suitable wherever a lot of transit traffic is concerned. So look for the matching floor vases for the hallway or living room in our shop. With floor vases made of this robust material, you no longer need to worry that the children will be able to hurt something.